Ever been in your local Placerville grocery store and had one of those shopping carts? You know, the one with a messed up wheel that wobbles like crazy. Your cart shakes and pulls to one side; if you're not careful, it's clean up on aisle three. Wheel alignment on your vehicle is a lot like that. 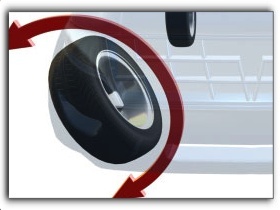 One or more of your wheels can get out of alignment; you feel a vibration in your steering wheel, which may also be off-center. Your vehicle might pull to one side and your tires start to wear unevenly; you could chew through a tire in a few months. Sometimes wheels get knocked out of alignment by something big like hitting a curb on a bumpy Placerville road or slamming into a pothole. But everyday driving takes a toll and vehicles lose alignment over time. That's why recommend an alignment check at regular intervals. At Main Street Automotive, Inc., we offer a full menu of quality auto repair and maintenance services, including wheel alignment. In your alignment inspection, your friendly and knowledgeable Main Street Automotive, Inc. technician will check your tires and your suspension system for damage. He'll test your alignment to see if it's within specifications. If not, he'll make necessary adjustments to get your vehicle wheels all pointing the same direction again. If your vehicle pulls to one side, you feel a vibration in the steering wheel or your tires seem to be wearing abnormally, talk with your friendly and knowledgeable Main Street Automotive, Inc. service advisor. You may need to put an alignment inspection at Main Street Automotive, Inc. into your shopping cart.